RETAL traditionally became a participant of the largest European BrauBeviale exhibition for the beverage industry, which took place in Nuremberg in November. This year RETAL presented an updated product range to their European colleagues. BrauBeviale exhibition has been regularly held since the late 70s of the last century, with its scale growing every year. In 2016, BrauBeviale has set another record by hosting in three days about 38 thousand specialists from all areas of the beverage industry: distributors, suppliers, manufacturers of equipment, technologies, services, raw materials, packaging materials and finished beverages. Most of participants are companies from Northern, Central and Eastern Europe. RETAL stand enjoyed great popularity among other 1300 exhibitors. Exhibition guests appreciated the stylish futuristic design of the site. RETAL brought to Germany the whole range of their products - preforms, caps, and containers. New developments of the company were of a particular interest among the visitors: containers for dairy packaging and the cap 1881 Xlight SF. By the way, the latter has been already actively used by European partners as a modern solution on the market of packaging of carbonated beverages. 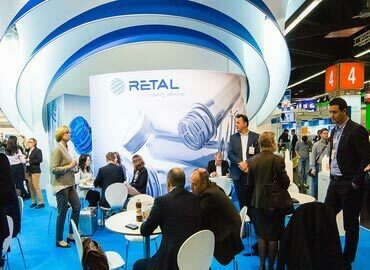 RETAL has been constantly improving in promoting their brand and reputation, therefore the preparation for the next BrauBeviale has already begun.